Beautiful home in Stowe Hollow with spectacular large hot tub! This home has all the amenities! 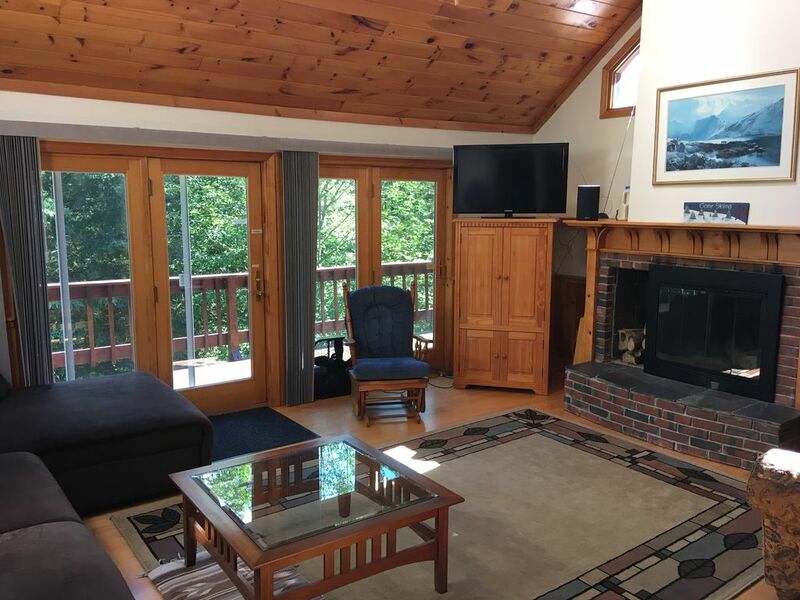 Take a relaxing soak in your private six-person outdoor hot tub before heading to the ski slopes of Mount Mansfield or classic hiking trails, each only a few minutes away. Top off the day's activities with a sled down the driveway or next door on the 100+ acres of conservation land, a game of pool in the recreation room, or another hot tub under the stars. Prepare a gourmet meal in your fully-equipped kitchen and relax by the cozy fireplace in the living room with cathedral-ceiling. The house is fully wired with a 40 and 32 inch flat-screen TVs, DVD player, stereo, and Direct TV with NFL Sunday Ticket. The inside of this home feels fresh and new, from the light maple floors and cabinets to the furnishings and bedding. The master bedroom features a king bed and private master bathroom in southwestern motif. There is an additional bedroom on the second-floor with queen and twin beds and private half bath, another bedroom on the ground-floor with a queen, and a bedroom in the basement with separate queen and twin beds. There is also a queen pullout couch and a queen futon in the basement recreation room. This home is privately located at the end of a dead-end road, yet has views of Mount Mansfield, Stowe Hollow, and the Pinnacle. This house is also family-friendly, and contains all the supplies (high chair, cribs, swingset, etc.) to make your family feels at home. Indoor ski storage is also included. Stayed here with a group of friends for the weekend. Layout of the house was great and it had all the amenities we needed. Made a fire every night, well stocked wood supply, and the hot tub was clean and nice to hop in on the chilly nights. Pool table downstairs was also nice to have and it didn't interrupt the people upstairs. Deb was great to deal with and very responsive. Would love to stay here again. My wife and I had a great weekend away. The mountain views from the deck we amazing and the house had everything you could ask for in a mountain retreat. I would definitely recommend this house to others. Beautiful woodwork throughout the house. A very cozy, family friendly house! My family and I recently stayed at Stowe Hollow and enjoyed it very much. It was very welcoming, charming and clean!! Even though the weather over the weekend wasn't that great and we probably spent more time than usual at the house, there were plenty of amenities to keep us occupied, jacuzzi, pool table and lots of games and puzzles. We will definitely be revisiting Stowe Hollow on our next trip to the area! We booked our stay late, and our hosts could not have been more accommodating and kind. They were perfectly communicative and helpful, although there wasn't really anything that we needed. Everything at the house was perfect and ready to go when we arrived, including the hot tub (which is stunning, overlooking the mountains, with some beautiful nighttime stars). The home itself is absolutely ideal for a quiet, relaxed getaway. It is very close to Stowe, for those who want to explore all of the great things the town has to offer. All in all, a perfect weekend. Thank you for everything! This place was amazing. Stay here if your traveling with multiple people to Stowe. Absolutely fantastic. Wonderful house in a beautiful setting! Enough room for our entire family! We treated our adult sons, wife, fiancée and grandchildren to a 4th of July family vacation. This 4 bedroom house had the perfect number of bedrooms, bathrooms and layout for all of us. The large deck allowed additional living space, and the grandchildren loved the swing set. Close to Stowe yet out in the quiet country. We would definitely stay here again!